Caiaphas, the High Priest, is mentioned 9 times in the Gospels and is one of those before whom Jesus appeared before being condemned to death by Pilate (Matthew 26; John 18). 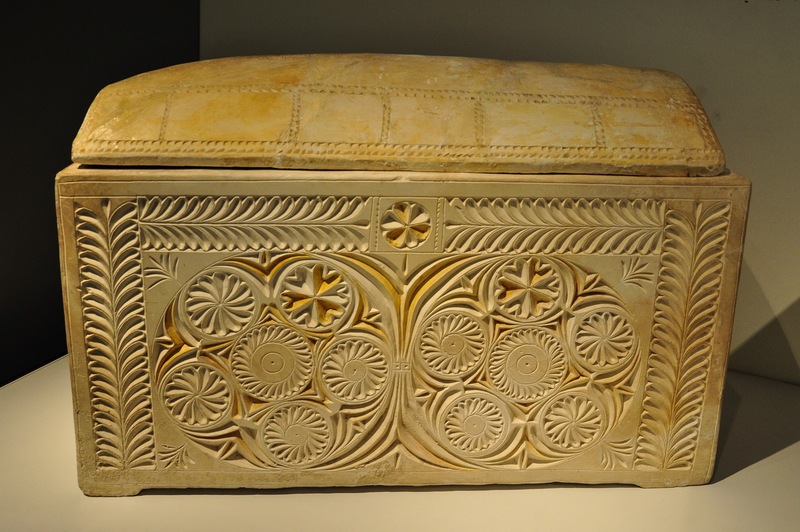 A few years ago a “bone box” (ossuary) was found, along with 11 others, in a Second Temple tomb located two miles south of Jerusalem on a hill that today is called “the hill of Evil Counsel” (John 11:49–50). On it the name “Joseph “son” of Caiaphas” was inscribed! The Joseph “son” of Caiaphas Ossuary. In the Israel Museum. Click on Image to Enlarge and/or Download. See below for the inscription. The ossuary has a slightly curved cover that is etched with designs. The front of the soft limestone ossuary is beautifully carved with rosette and leaf designs. Note the red paint is still visible in some places. The bones of six(!) individuals were found inside of the ossuary: 2 infants, 1 child, 1 teen aged boy, 1 adult woman, and a man—approximately sixty years old. 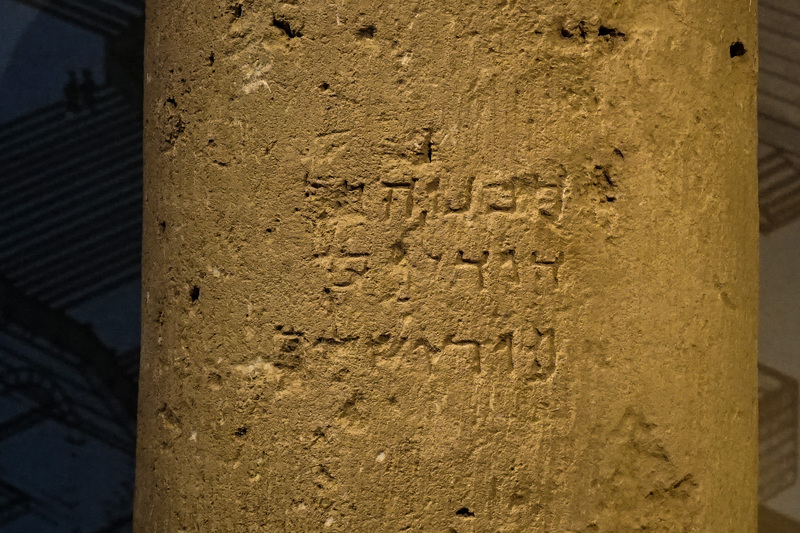 On one of the short sides, and on the back, the name Caiaphas had been etched into the stone with a nail—see the image. It is evident that the ossuary was prepared in a workshop, but then when the bones were placed inside the name was inelegantly scratched on to it. For an accessible discussion of the name Caiaphas, plus others appearing on ossuaries, see Reich, Ronny. 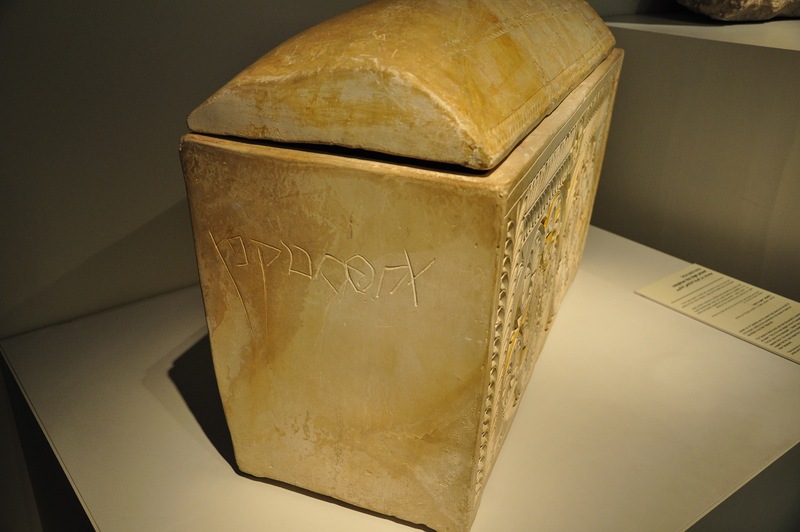 “Caiaphas name Inscribed on Bone Boxes.” Biblical Archaeology Review 18, no. 5 (September/October 1992): 38–44. Place of Peter’s Denial of Jesus? 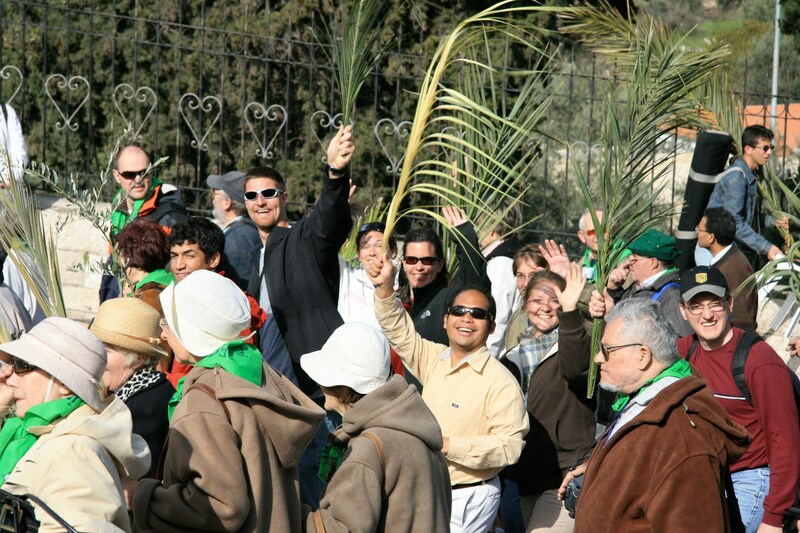 Many Christian tour groups to the Holy Land will visit the Church of Saint Peter in Gallicantu. This church is located on the eastern slope of the western hill of ancient Jerusalem—south of the Old City wall, on present day Mount Zion. View looking west southwest at the church of Saint Peter in Gallicantu. Below and to the right of the church note the excavations and the staircase the leads up and down the hill that dates to the Second Temple Period. According to a sixth or seventh century tradition this is the site of the Palace of Caiaphas before whom Jesus was questioned (mentioned 9 times in the New Testament; Matt 26:57–68; Mark 14:53–65; Luke 22:54). According to the Gospel accounts, Peter, in the courtyard denied any association with Jesus after which the “rooster crowed” (= Latin: galli-–cantu; Matt 26:69–76; Mark 14:66–72; Luke 22:55–65; John 18:25–27). The church was completed in 1931 and the Assumptionist Fathers serve there. The church is built on three levels, the bottom of which contains a series of rock cut caverns that are said to date to the time of Jesus. 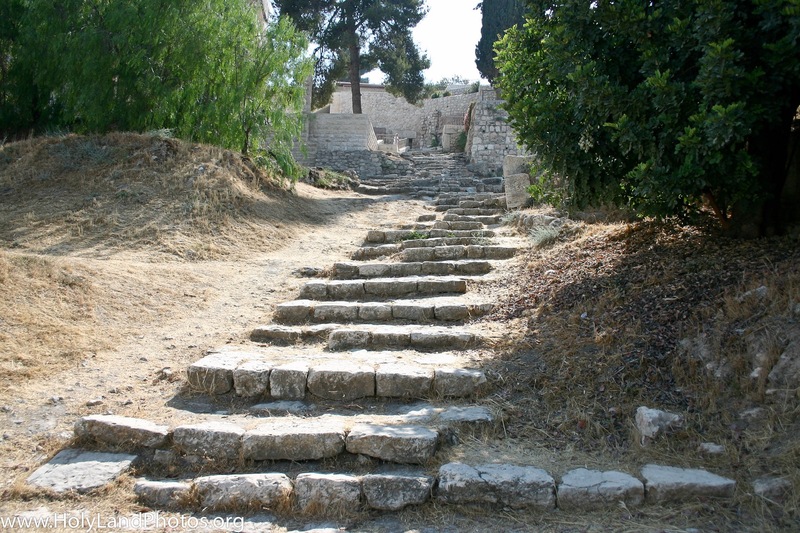 View looking west at the steps that ascend the western hill (Mount Zion) from the central Tyropoeon) Valley.possible that Jesus walked on these steps. Excavations to the north of the church have revealed a variety of rock cut remains along with a flight of steps that leads up and down the hill—it is said to date to the time of Jesus (= Second Temple Period). View of one of the underground rock cut chambers located on the lowest level of Saint Peter in Gallicantu. Supposedly the church is build over/near the house of Caiaphas the High Priest (mentioned 9 times in the New Testament), before whom Jesus was questioned. According to tradition, Jesus was imprisoned here during that time and later Peter and John were imprisoned here as well (Acts 5). 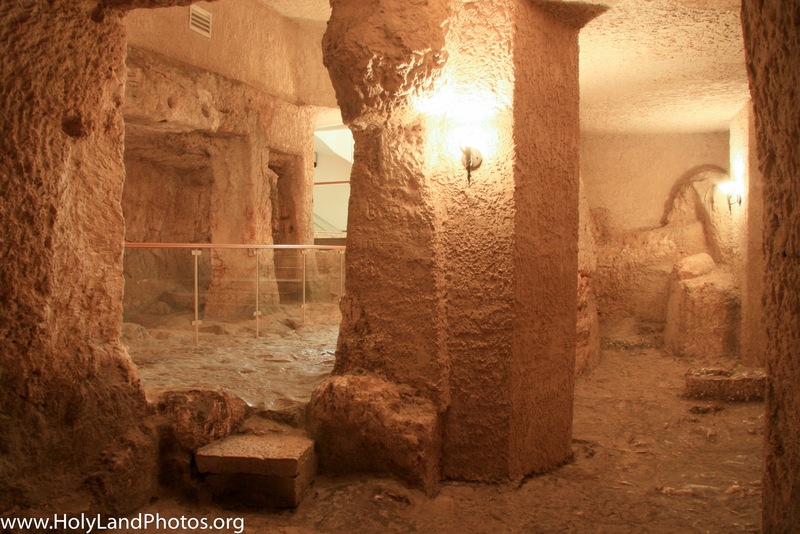 The caves/chambers evidently date to the Second Temple Period. For 16 images of Saint Peter in Gallicantu Click Here. 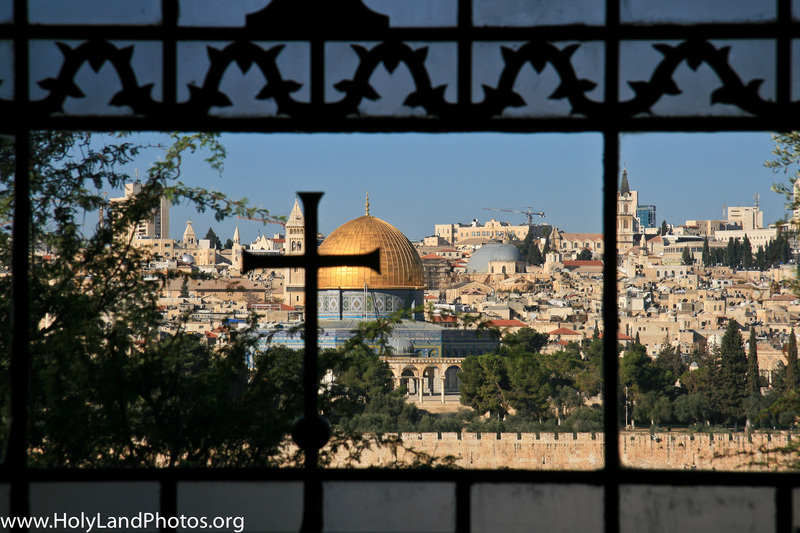 On Sunday, 14 April, Christians will be remembering Jesus’ entry into Jerusalem. For those of you who might be looking for High Resolution images related to the entry of Jesus into Jerusalem, the Last Supper in the “Upper Room,” and the events clustered around the final week in his earthly life I will be posting some useful links in the days ahead. 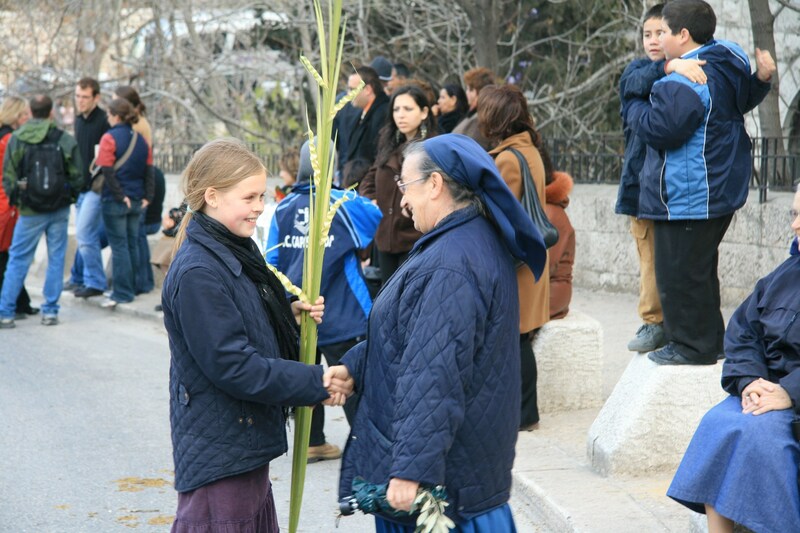 To view 10 images (with commentary) of a modern procession commemorating this event Click Here. 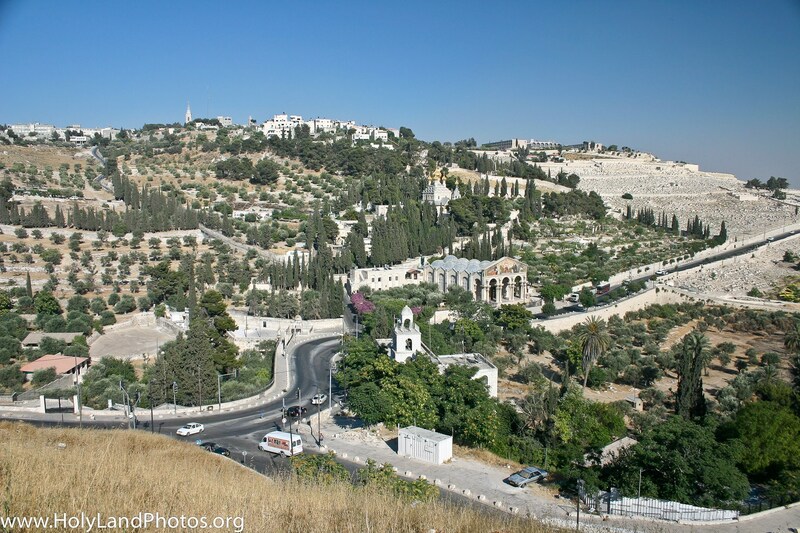 Use the following links to find High Resolution images related to Gethsemane, the Upper Room, a Rolling Stone Tomb, Gordon’s Calvary, the Garden Tomb, and the Church of the Holy Sepulcher. 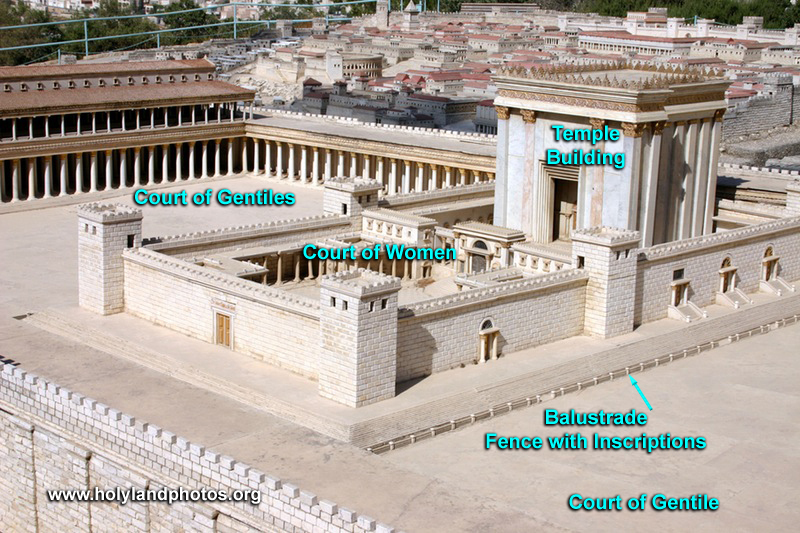 The Jewish Temple in Jerusalem was surrounded by a fence (balustrade) that was about 5 ft. [1.5 m.] high. On this fence were mounted inscriptions in Latin and Greek forbidding Gentiles from entering the temple area proper (image below). One complete inscription was found in Jerusalem in 1871 and is now on display on the third floor of the “Archaeological Museum” in Istanbul. The Temple Inscription warning Gentiles not to proceed beyond this barrier—on threat of death. Istanbul Archaeological Museum. This six-line fragment of the Temple Warning was found by J. H. Iliffe east of the Old City of Jerusalem wall—near the Lion’s Gate. Translation of the inscription from Elwell, Walter A., and Yarbrough, Robert W., eds. Readings from the First–Century World: Primary Sources for New Testament Study. Encountering Biblical Studies, general editor and New Testament editor Walter A. Elwell. Grand Rapids, MI: Baker, 1998, p. 83. Click Here to view for purchase from amazon.com. Recently it was announced that a Potter’s Inscription was found in secondary usage (= spolia) near the International Convention Center in West Jerusalem. Is it possible that the “Potters’ Field,” mentioned in Matthew 27, was located near here (see end of post)? 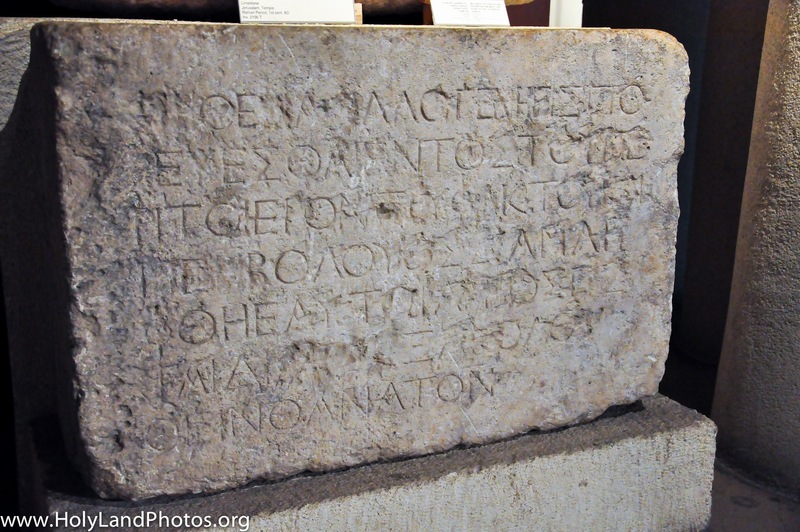 The Aramaic inscription reads “Hanania son of Dudolos from Jerusalem.” Click on image to Enlarge and/or Download. 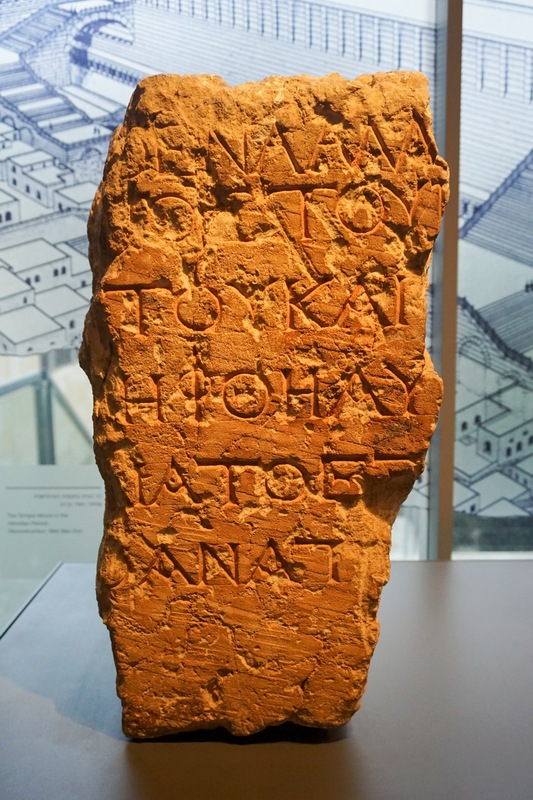 The Aramaic inscription reads “Hanania son of Dudolos from Jerusalem.” It is the first epigraphic evidence to the name “Jerusalem” spelled as Yerushalayim (as it is written Hebrew today), as opposed to Yerushalem or Shalem. 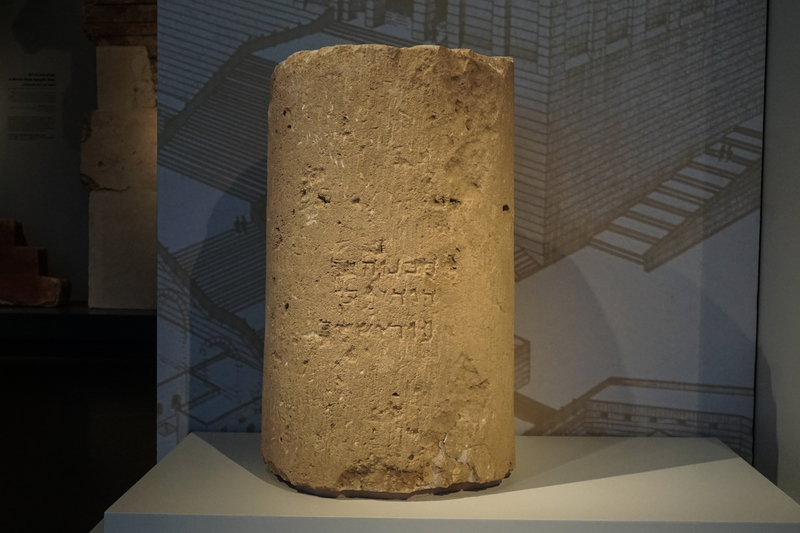 The full “column” that bears the Aramaic Inscription—it is about 2 feet tall. In a recent edition of Artifax (Autumn 2018, p. 2) the editor notes that it is interesting that the 30 pieces of silvers that Judas returned to the Temple was used to purchase a “Potter’s Field.” This “potter’s village” is only a few miles west of the site of the Second Temple. Yom Kippur 1973 — Did Golda Meir Know An Attack Was Coming? Today, September 18/19 2018, is Yom Kippur (the Day of Atonement)—the Jewish Fast Day when there is no work, no traffic, no TV, no radio, etc.,. 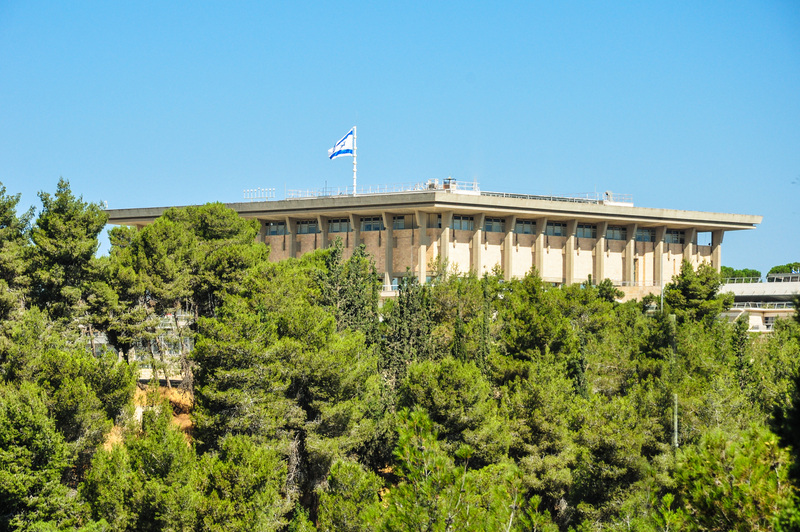 On Yom Kippur 1973, Saturday, October 6, my family and the family of Jim Monson were walking below the Knesset, Israel’s Parliament, when we saw a few cars racing up and down the street. We wondered what was going on, in light of the fact that driving, especially in Jerusalem, was/is forbidden on the day. Soon the air raid sirens went off!! In a coördinated surprise attack, both Egypt and Syria had attacked Israel on its most sacred day (BTW it was also Ramadan!). The Monson’s headed back to their house, and we headed back to our apartment. When we arrived at our apartment we found our neighbors cleaning out old mattresses, bicycles, etc., from the bomb shelter. The husband of one of our friends was stationed in one of the Israeli forts on the east side of the Suez Canal—the ones that the Egyptians overran. But his fort was the only one not to be overrun! How much of a surprise was the attack? A telegram (pre-internet age) from the head of Mossad, Zvi Zamir, to Prime Minister Golda Meir, warned, in the morning of Yom Kippur, that Egypt would attack that afternoon. We all know what happened! 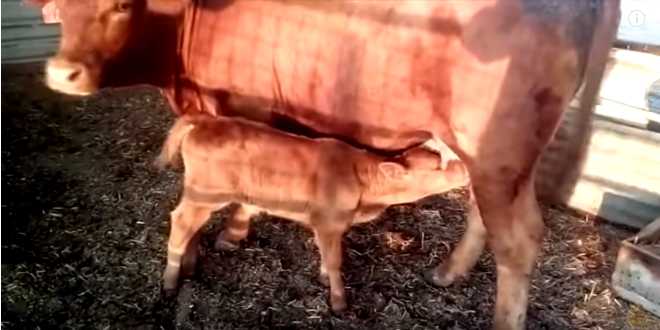 The 10th Red Heifer? And Dominus Flevit? Red Heifers were used, along with cedar wood, hyssop, and wool or yarn, in a mixture that was used by the ancient Israelites/Judeans for ritual purification (Numbers 19). According to Rabbinic sources 9 Red Heifers were slaughtered from the time of Moses until the fall of Jerusalem in 70 CE. In order for the temple to be rebuilt and sacrifices to be reinstuted, the priestly line would need to be purifed—and a RH would be needed to produce the necessary purification material. Years ago they thought that a RH had been produced in Nebraska (USA)—but due to Israeli laws such an animal could not be imported to Israel. Almost three years ago the Temple Institute inaugurated its Raise a Red Heifer in Israel program. Due to laws restricting the importation of live cattle into Israel, the Temple Institute imported frozen embryos of red angus, implanting them in Israeli domestic cows. The pregnant cows were raised on cattle ranches in different locations throughout the country. The cows are giving birth this summer with several calves already having been born. One week after it’s birth, the newborn red heifer was certified by a board of rabbis as fulfilling all the Biblical requirements. The rabbis emphasized that the heifer could, at any time, acquire a blemish rendering it unsuitable. They will be inspecting the calf periodically to verify its condition. The red heifer was the main component in the Biblically mandated process of ritual purification for impurity that results from proximity or contact with a dead body. Because the elements needed for this ceremony have been lacking since the destruction of the Second Temple, all Jews today are considered ritually impure, thereby preventing the return of the Temple service. The red heifer is described in the Book of Numbers. Several heifers have been found in recent years that seemed to qualify but ultimately were unsuited for the ritual. . . .
No less stringent than the laws pertaining to the heifer are the laws pertaining to the site where the heifer is burned. Almost 30 years ago, Rabbi Yonatan Adler, who is also an archaeologist, performed an in-depth study into the textual references to the site where the red heifer was burned, publishing his results in in the Torah journal Techumin. 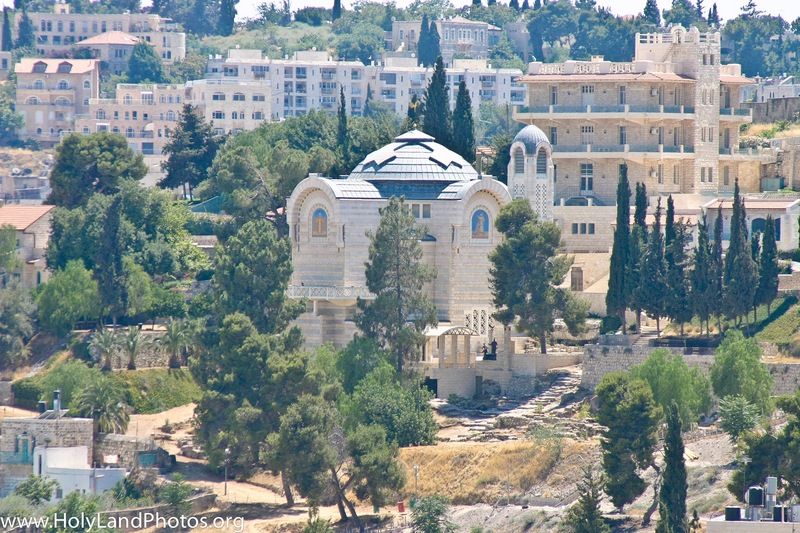 His calculations, based on the Holy of Holies being located where the Dome of the Rock stands today, led him to a spot where Dominus Flevit, a Catholic Church built in 1955, now stands. Archaeological surveys discovered unique characteristics of the site that corresponded to descriptions in the Talmud. View from the Temple Mount area toward Dominus Flevit—the site of the slaying of the Red Heifer? 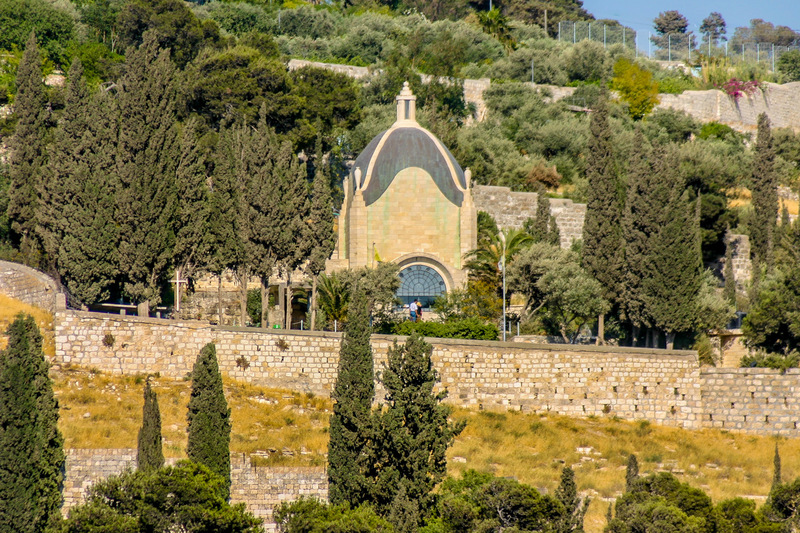 View from Dominus Flevit towards the Temple Mount (aka Haram esh–Sharif). What did the "chains" (= "handcuffs") that bound Peter and Paul look like? Where did Paul and Silas Appear Before the Magistrates at Philippi?